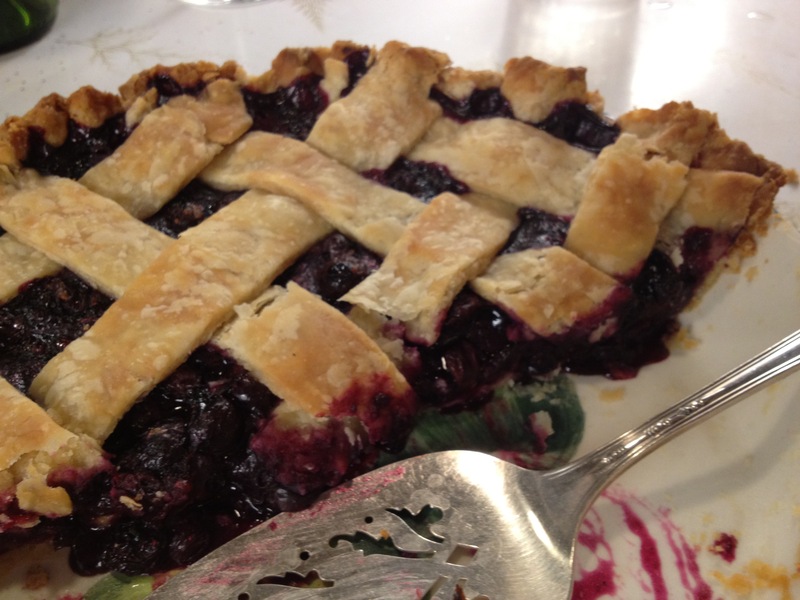 This past weekend, I made two desserts, as I was having two dinner parties. Our friends were coming to dinner on Saturday night in the country and both boys and their girlfriends were coming to dinner on Sunday in the city. Additionally, my husband was going to visit his 94-year-old mother in Baltimore on Monday and needed to take sweets to her. It’s what she craves and I aim to please. So on Saturday I made both desserts. One was a favorite Christmas cookie in our family that I just cut into larger squares for dessert. Our boys were saying, “Mommm, a little early don’t you think?” And then one of the girlfriends said at the dinner table, “OMG, these are so good, I could eat these until I vomit!” Now how’s that for a compliment? She said she ate two for breakfast the next morning and then wanted the recipe. That was for the Hello Dolly Squares. 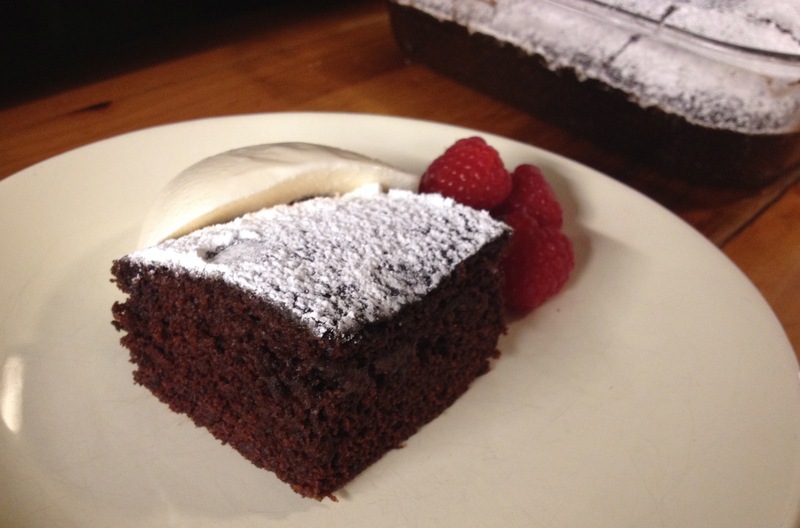 And then the other dessert I made was this amazing recipe from Mollie Katzen for her Made-in-the-Pan Chocolate Cake. I heard her speak a few weeks ago at a Hudson Union Society event and someone in the audience brought up this recipe, which she then talked about and read aloud. It is so quick, easy and truly amazing that it works. It is even vegan!!! – which I personally don’t care about, but if you do, then this is for you! The key is to mix the dry ingredients incredibly well with a whisk. Use a clear glass pan and pick it up to inspect the bottom and sides to make sure you don’t see any globs of white flour or dark cocoa still lingering around. Then when you add the liquids, slowly stir and whisk and scrape and scrape and whisk until all is combined and smooth. No lumps allowed!! Simple, delicious, and no extra bowls to clean. This is a super moist cake that tastes like a lot more work. You can pull this off with ease on any weeknight for surprise guests. Just make sure you always have cocoa around. Preheat oven to 325°F. Have ready an 8-inch-square glass baking pan. Put flour, cocoa, sugar, salt and baking soda into the pan. Mix it together thoroughly with a whisk and spatula making sure all is blended together and no white flour clumps are visible. Lift up the pan and check to make sure all is blended on the bottom and especially in the corners. Add water, oil, vanilla extract and vinegar. Stir slowly with a whisk in small circles to blend. As it becomes a batter, mash, scrape, and stir with whisk and spatula until smooth, particularly scraping and blending from the corners of the pan. Scrape the sides with a rubber spatula, and spread it evenly. Clean the edges, then bake for 30 minutes. Cool completely in the pan, on a rack. Dust with some powdered sugar (there is no need for frosting) and cut into squares. I served it with LOVE, a dollop of ice cream and a few raspberries for a really pretty and super easy dessert. Entertaining does not always have to mean you cooking everything, especially when you live in a city like New York. It is so much more important to get together with the people you love and don’t let anything or any excuse get in the way of that. My good friend, Susan, pointed this out to me and executed a beautiful example this past week. We were invited to their apartment this past Tuesday evening. Now Susan always does a beautiful job. She usually makes all the food and we have such a good time getting together and catching up and discussing politics. But this past Tuesday was so darn hot here, she decided to change it up a bit. No matter, as long as you serve it with LOVE, it makes no difference. She had her fish store, Dorian, on York Avenue between 83rd and 84th Street, deliver some beautiful poached salmon fillets with some green sauce on the side. Then she put together a gorgeous platter of the salmon with the sauce, along with some fresh cucumber and dill. She made a cold yummy rice salad ahead of time with black nicoise olives, served some gorgeous sliced heirloom tomatoes with chopped fresh basil along with some guacamole (also from the fish store). Add some warm rolls and butter and we were all set. It was so delicious and THE perfect menu for a hot summer night. Plus, she could spend the whole cocktail time with us in the living room as dinner was already made. Dessert was a French yogurt cake she made, topped with a dallop of mascarpone cheese and fresh blueberries and raspberries. The perfect ending to a perfect meal!! But I forgot to take a picture!! 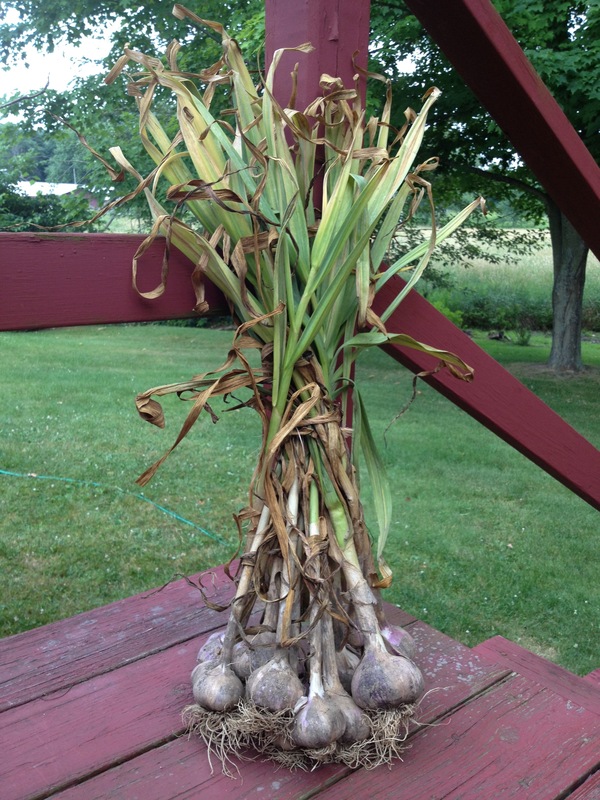 As part of our hostess gift, we brought a little bit of the country to them – Ethel’s garlic. 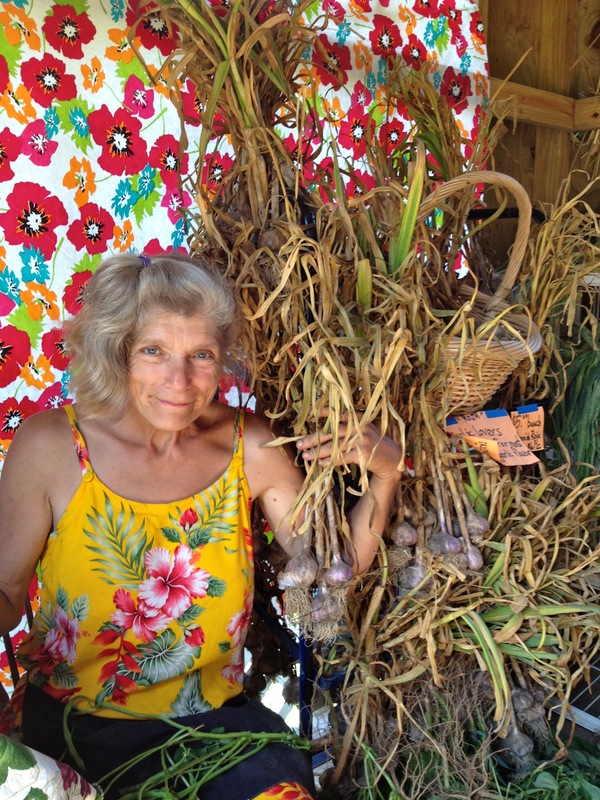 Susan says they won’t be able to take the subway after eating this garlic! Taxis all the way from now on! Woohoo! 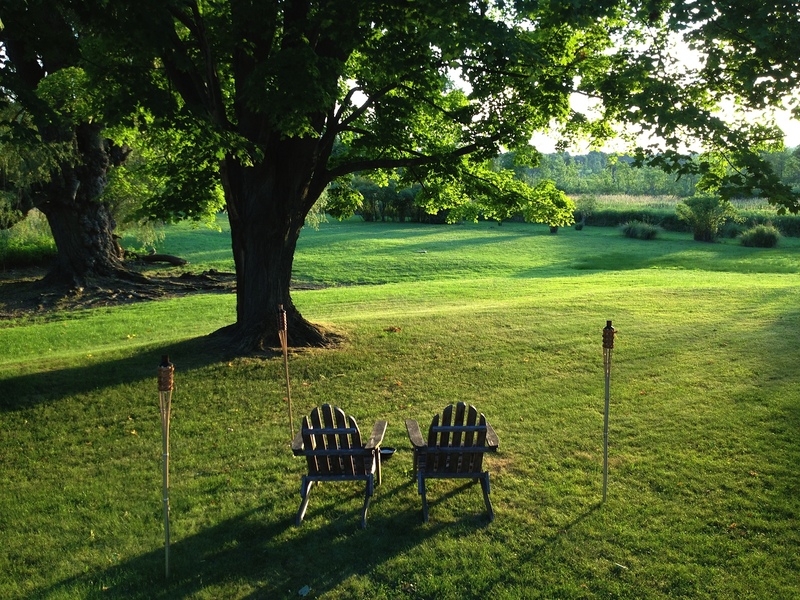 We are rounding home stretch here on our vacation week upstate. We had glorious weather the whole time to be greeted by rain this afternoon. But that’s okay, it feels like a Nantucket day today so I am writing and reading and hopefully napping soon, a true vacation luxury. I always end up saying to my husband, after my daily bike ride, that there is no prettier place than here. (Well Bali may be prettier but I’ve not been there yet.) It is just so darn pretty here – the sky even competes with a South African one! We often just sit staring out at our backyard, watching the show of animals that randomly appear, which provides a great sense of renewal to us city dwellers during the week. Here are some photo highlights of our week. I’ll post some bike riding pictures soon! 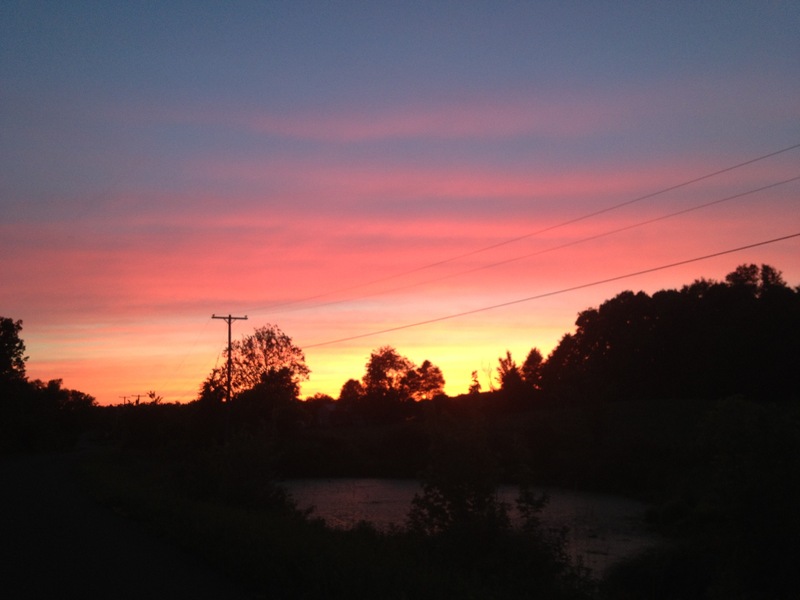 Hudson Valley sunsets can’t be beat! 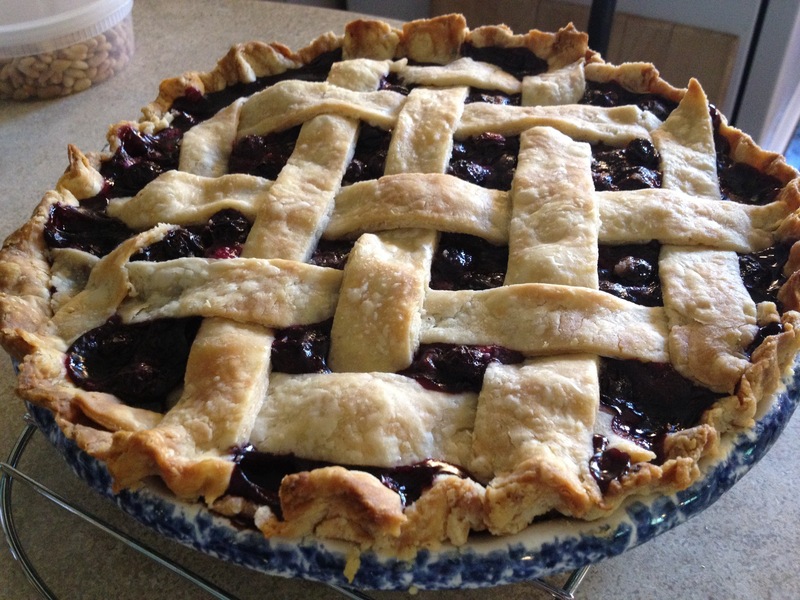 My 4th of July blueberry pie – served with Blue Marble vanilla ice cream and fresh raspberries to make it complete! I’m very proud of this super flakey crust.